After six months with these sound meditations . . This deeply relaxing Law of Attraction hypnosis recording by Glenn Harrold will help you to project your goals into the universe with real power and intent. The recording will help you harness your energy and focus on any goal you choose. When every cell in your mind, body and spirit are resonating at an intense frequency, the Law of Attraction will deliver back to you exactly what you are projecting out into the universe. This audio presentation by best-selling UK hypnotherapist Glenn Harrold combines powerful clinical hypnotherapy techniques with state-of-the-art digital recording. During this audio you will hear a pleasant voice guiding you through each of the stages. There are a number of specially created sound effects that can be heard in the background at certain times. These subtle sounds are written in certain keys and frequencies to enhance the therapeutic content. Overcome disease, illness, or discomfort by using the healing power of your own mind. 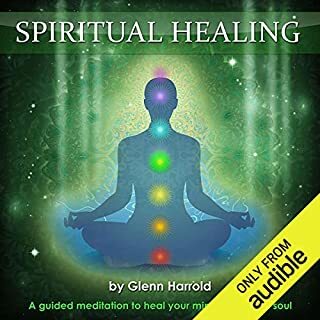 This superb, high-quality hypnosis recording by Glenn Harrold, the UK's best-selling self-help audio author, will help you become your own self-healer. Developing a positive mind-set toward illness or injury is crucial in helping the body to heal from illness or disease. Hypnotherapy is uniquely effective in programming your mind to overcome insecurity and anxiety and helping you develop a positive attitude toward your health. A superb, high-quality hypnosis audio program combining skilled hypnotherapy techniques with state-of-the-art digital recording technology. This empowering audio will help the listener feel energized and uplifted by guiding you on a powerful healing journey through the seven main energy centers of the body, called the chakras. You will hear angelic vocals and sounds tuned to the frequency of each chakra while you visualize a healing process through each stage of the meditation. Really good to relax and meditate! Lose weight the easy way with this superb, high quality weight loss hypnosis audio by Glenn Harrold, the UK's best-selling self-help audio author.Glenn's unique hypnotherapy recording will help you to programme your mind to accept that you eat small amounts of healthy food and genuinely LOVE exercising and being active. 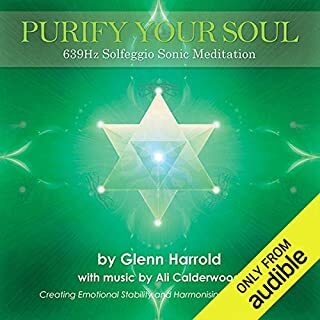 This is one of a series of six meditation recordings by Glenn Harrold and Ali Calderwood that are based upon the ancient Solfeggio musical scale. Each note in this scale has specific healing properties, and this recording uses the third note, which resonates to a frequency of 528hz. This frequency works to heal broken DNA, healing on all levels - emotional, mental, spiritual and physical - bringing relief from anxiety, fatigue, and control issues. It helps to release negative thinking. Consistent use of this recording will help you to create miracles in your life. This recording contains two meditations. The first you can use in the daytime, as it will guide you back to full waking consciousness at the end. The second will guide you into a deep sleep state at the end, which makes it ideal for using before you go to sleep at night. When you are instructed to repeat affirmations, connect with positive feelings (e.g. happiness, joy, love), this will help you absorb the suggestions on a deeper level. You don’t have to repeat the affirmations out loud, but do make a strong connection with them. You will be guided into a deep state of mental and physical relaxation, and it is recommended that you listen through headphones while lying or sitting somewhere comfortable where you won’t be disturbed. Listen every day, initially for 21 days and then as and when you wish. However, this is purely a guideline, and you can listen to the recordings as often as you like. It is important to remember that you are being guided, so you will always be in full control of the whole process. 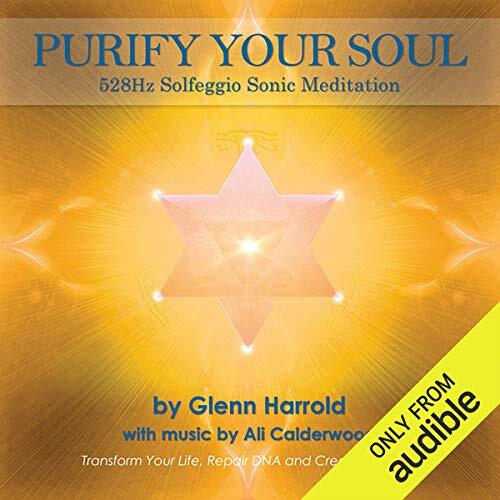 This powerful recording is a completely safe and effective way of helping you to clear away deep-rooted blocks on a cellular level and find peace. Modern science is now beginning to recognise what the ancient mystics throughout time have been saying: that everything is in a constant state of vibration, and therefore everything that is vibrating has a sound (even if it’s not audible). Everything also has its own optimum rate of vibration, and this is called resonance. When we are in resonance, we are in balance and harmony with creation. Emotions and mental states also have their own optimum resonance, and with the recognition that every organ, and every cell, absorbs and emits sound, we can therefore understand how specific sounds and frequencies can be used as powerful healing tools. The music with this series of mediations has been specially crafted and precisely tuned to transmit each of the Solfeggio frequencies. By combining these sounds with a guided meditation, you also have the potential to release deep-rooted blockages. These compositions also contain an array of sacred instruments and sounds, such as crystal bowls and didgeridoo and sacred chants, which work to further enhance the effects of the Solfeggio tones. Glenn Harrold has a nice voice, and his vocal techniques really resonate with me in a positive way. I listen to this almost every night. Amazing feelings of Peace and Wellbeing. I've been suffering from insomnia for the past few months, tried taking medication but hated the side effects. I've done group guided meditations before but never bought a recording of one so this is my first experience..I found it VERY helpful. Now I don't know if this will heal my 70 year old DNA or create any miracles but it DID help me fall asleep and when I awoke in the middle of the night-a frequent experience for me-I simply started it again on my iPad and fell back asleep. The speakers voice is very British but this West Coast American found it soothing. The background music was smooth and non invasive. I might buy the rest of the series just to have something different to help me sleep. I recommend it for those who have difficulty going to or staying asleep. Where does 528hz Solfeggio Meditation rank among all the audiobooks you’ve listened to so far? It's not really an audiobook per-say, but a guided narrative. A wonderful guided narrative that moved me greatly. What was one of the most memorable moments of 528hz Solfeggio Meditation? There was a part where halfway through I started to cry during because I felt so moved by where my mind was leading me as his voice guided me. It was a good cry. From joy. I have never experienced anything like that before. Have you listened to any of Glenn Harrold’s other performances before? How does this one compare? No. I have never listened to Glenn Harrold before. What made the experience of listening to 528hz Solfeggio Meditation the most enjoyable? I could sense the vibrations while still being able to focus on the narrative. I especially liked the narrative at the end. i dont know what to say. ive never felt this sensation while listening to this. i acttually had tears leaving my eyes and i couldn't explain it. just a real nice peaceful feeling. I suffer from insomnia and this puts me to sleep within minutes. I'm not sure about the hypnosis when I'm awake but Glenn Harold has an amazingly tranquil voice. get it....try it....why not? it's cheap! great medication for the soul. Loved it. shared it with my girlfriend it helped us a lot. I love this series of hypnotic relaxation / meditations. This one put me in a wonderful state of conscious healing and awareness. ...as for your voice.. perfect! I found it very relaxing. Beautiful accent. I think some people need to lesson up on their accents. It is a London accent not a cockney accent. Google cockney you’ll find it’s a dialect. I loved it absolutely love it.its really interesting . Superb, I can recommend this set of meditations enough. Deeply moving and healing on a physical, emotional and mental holistic level. Highly recommended for anyone on a path of self healing. Not the best of it's kind, but good enough to help you relax. when you need to. this guided meditation is one of my favorites, and the tonal sounds really help. highly recommend this and the other solfeggio Meditations in the series. whether this meditation audio book has transformed my life is not possible to say, but it has transformed how quickly I can get to sleep and puts me into an initial deeper sleep. I have a sleep tracker watch and it is obvious which times I have used this. Not sure about the story, I've never been awake to hear the whole thing! Puts me to sleep instantly and is very relaxing. Thank you! I have 3 of this series and find Glenn's voice and technique very effective for getting into deep meditation & relaxation. The music and ambient sounds take you to another place. These meditations are very uplifting and I never get all the way through when listening to sleep. Very useful to have the 2 tracks. Meditation to wake and asleep. Nice touch. Would you try another book written by Glenn Harrold and Ali Calderwood (music) or narrated by the narrator? The actual meditation was ok but I found it really hard to get past the narrator sounding like Danny Dyer so couldn't get into it properly. Would you ever listen to anything by Glenn Harrold and Ali Calderwood (music) again? If it was read by someone with a different voice! Who might you have cast as narrator instead of the narrator? Someone with a softer, less gravelly voice and less of an accent. Need to be much less distinctive. It should be about the meditation not getting stuck on the guys voice. The meditation was good, but it was so hard to ignore the narrator I didn't enjoy it as much as I could and should have. Although it did make me laugh but fr the wrong reasons. Great voice, wrong subject. Get someone else to narrate it! inspiring and ready available help. Outstanding ! I have used Glenn Harrold guided hypnosis meditation for a while now and it helps me with my anxiety, panic attacks and insomnia, without this help my life would be unbearble thanks Glenn. Your voice is soothing and gentle.